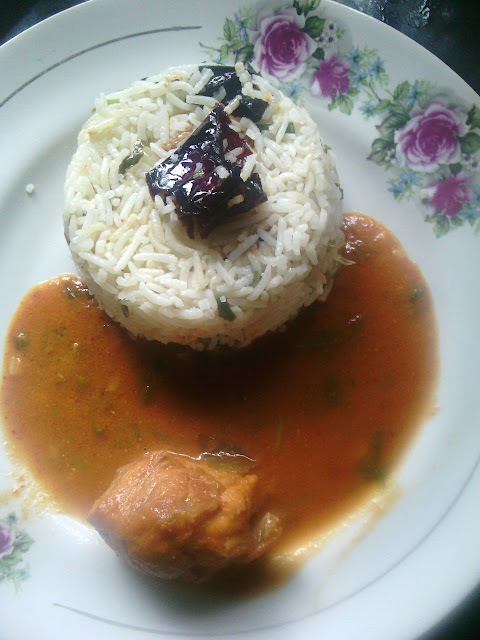 This is a very simple recipe of Burnt Chilli Garlic Chicken Rice. Frying the garlic and chilli till brown gives this rice its unique flavour. This dish is sure to satisfy your craving for chinese. So here is the recipe for this delicious Burnt Chilli Garlic Chicken Rice. In a broad non stick pan add the oil and saute the garlic and Kashmiri chillis till it turns brown on high flame. Add the green chillies and spring onions and saute for 2 minutes. Now add the shredded chicken and vegetables. After a minute add the soya sauce, vinegar and rice, Add the salt and mix everything well and cook for 2 minutes. Your Burnt chilli garlic chicken rice is ready to be served. Garnish it with spring onion greens and fried garlic.